The Nitrate Film Interest Group is a new interest group set up by the Association of Moving Image Archivists, or AMIA. The group, which describes itself below, is dedicated to promoting understanding about nitrate film and, through its Flickr pages, providing an online space for placing images of unidentified films, inviting comment. This FLICKR account is to help archives around the world identify unknown films in their collection. We will do our best to post what information is known about each film along with the frame scans. If you are able to provide any information such as title, actor, approximate date, or anything helpful then please leave a comment. 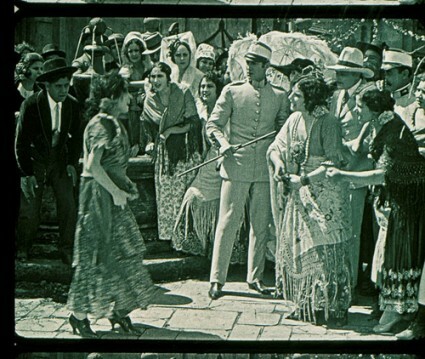 Films that have multiple frame scans have been grouped into sets that can be found along the right side of the screen. By clicking on the set information will appear that applies to all of the frame scans from that reel of film. We suggest that you navigate these photos through their sets so as to see all of the information that is provided. The Nitrate Film Interest Group is a part of the Association of Moving Image Archivists’ interest groups. Check out AMIA at http://www.amianet.org. The Nitrate Film Interest Group is dedicated to promoting education about nitrate film as well as functioning as a resource for those interested in and working with nitrate film by becoming a major resource for archivists’ needs. To check the frame stills of unidentified film (which include sound films), click on the Photostream link on the Flickr page. If you know something, do add a comment – no one has done as yet.